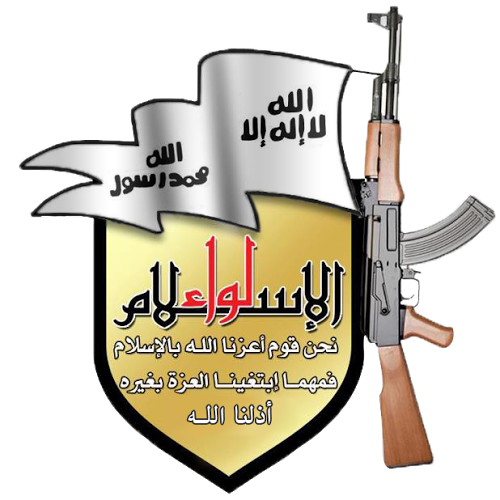 Liwa al-Islam (Arabic: لواء الإسلام, meaning Banner of Islam), also known as the Islam Brigade is a Syrian rebel group fighting against the Syrian government in the Syrian civil war. It is part of the Syrian Liberation Front and operates chiefly in the Damascus neighborhoods of Douma and Eastern Ghouta. They claimed responsibility for carrying out the July 18, 2012 bombings in Damascus that killed Defense Minister Dawoud Rajiha, Deputy Defense Minister Asef Shawkat, and Assistant Vice President Hassan Turkmani. Liwa al-Islam is a driving force behind actions in Damascus and is known to cooperate with Jabhat al-Nusra and conduct joint operations. 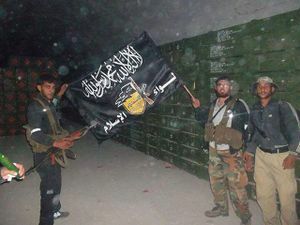 Rather large Liwa Al-Islam convoy on August 19, 2013, in "Kalamoon mountains". The guy with the green camo seen on the lead truck from behind at 0:43 could be Tahreer al Sham leader Firas Al-Bitar who showed the UN Investigators around in Moardemiyeh, as his buddies in grey camo seem to match as well. The Flood, Syrian TV documentary with English subtitles, uploaded October 3, 2013. Contains "confessions" of "terrorists" centering around the actions of Liwa Al-Islam and their leader Zahran Alloush. ↑ 1.0 1.1 O'Bagy, Elizabeth (2013-03-24). "The Free Syrian Army", Institute for the Study of War. Retrieved on 26 March 2013. ↑ Aron Lund (2013-06-17). "Freedom fighters? Cannibals? The truth about Syria’s rebels", The Independent. Retrieved on 18 June 2013. This page was last edited on 14 October 2013, at 12:57.